Welcome to The Upstairs Train. 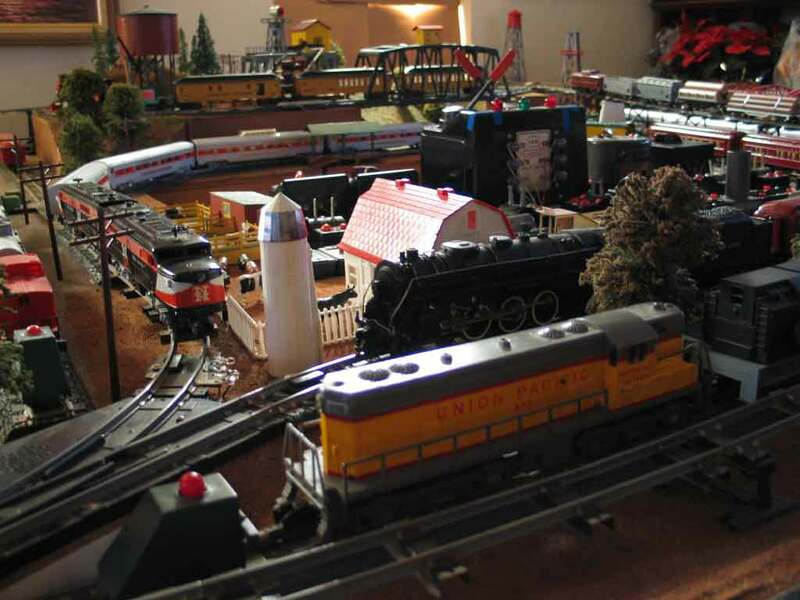 It is an American Flyer S-Guage model railroad on a 10' X 11' table in our upstairs "bonus room" - thus its name. I hope you enjoy seeing it as much as I've enjoyed building it. The Upstairs Train doesn't simply go around in circles. There are seven intersecting loop routes on two levels, passing over, under, and around one another, for a total of 127 feet of track. There are four bridges, three tunnels, and trestle slopes up and down between the levels. 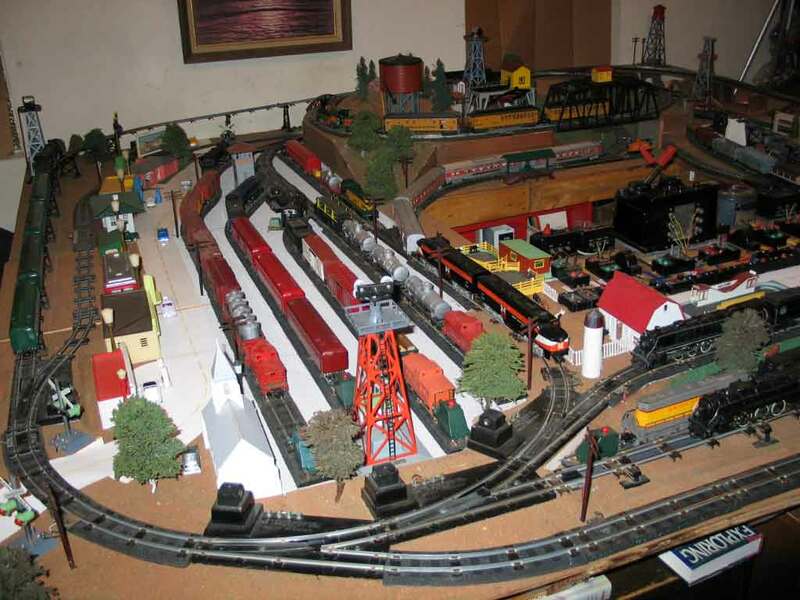 The layout has three roads with five grade crossings controlled by flashing warning lights, a bunch of automobiles and trucks, twenty one buildings including eight towers, and six operating accessories. S-Helper Services and a couple of cars from MTH, American Models and Crown Models. At last count, there were sixty five engines (50 powered and 15 dummies), eighty four passenger cars, four hundred and fourteen freight cars, and a handcar. (I keep adding engines and cars so these counts are badly out-of-date!) There were sixteen steam engines and forty nine diesels: seventeen Geep diesel engines (fourteen powered and three dummies), a Baldwin diesel, an SW-1 switcher, an NW-2 switcher, three single unit Alco powered diesels, two Alco dummy B-Units (for which I need the matching A-Units), four dual Alco diesels (powered unit plus dummy), and four ABA Alco diesels, and the Lionel Flyer Southern Pacific Alco ABBA diesels. There were five old-style passenger cars from the 1800s in the Frontiersman set, seven New Haven style cars in two trains, fourteen Pullman Heavyweights in three trains, and thirty nine streamliners in eight trains. That makes up fourteen passenger trains. In addition, three streamliners (a chestnut 963 and unstriped satin 960 & 963) were the beginnings of two more passenger trains. In the fall of 2005, I set myself the goal of collecting at least one variation of each of the hopper cars that Gilbert made, and I have almost achieved that goal. Around Christmas time, I got fascinated by the Christmas/Holiday cars that Lionel made in their American Flyer line, and I have now collected all of them. That got me started collecting freight cars. Up to that time, as a kid and even as an adult, I was more interested in passenger trains. 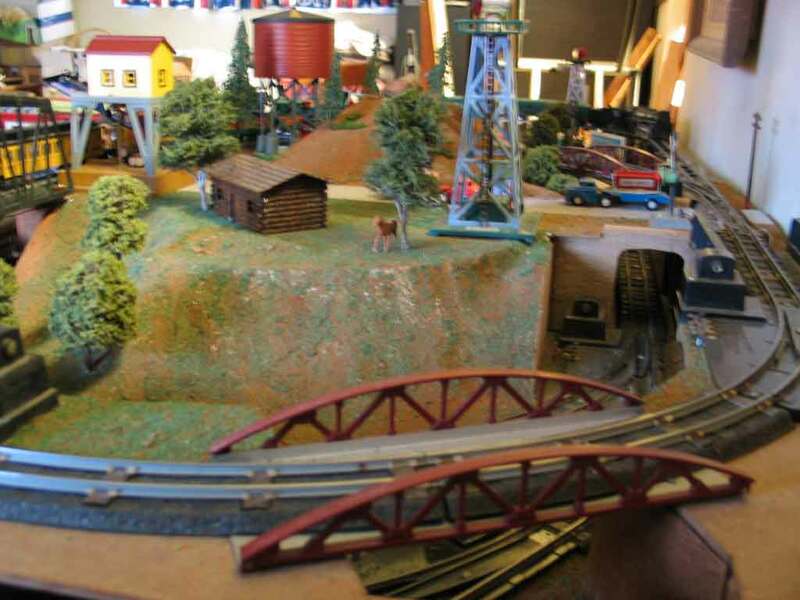 As I got into freight cars and sets I discovered that I could no longer count how many freight trains I had because I could assemble so many of Gilbert's sets from the cars in my collection. 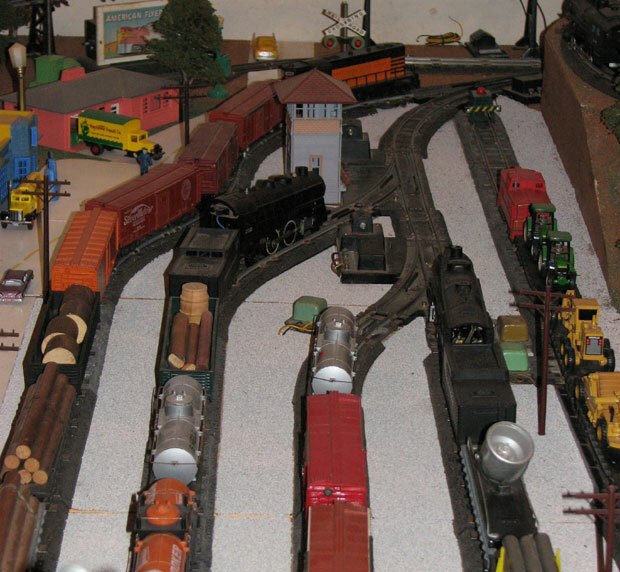 Take a look at my freight sets page and you'll see what I mean. In addition to those, I run a couple of favorite freight trains that Gilbert never sold as sets. I suggest you start by taking The Grand Tour. 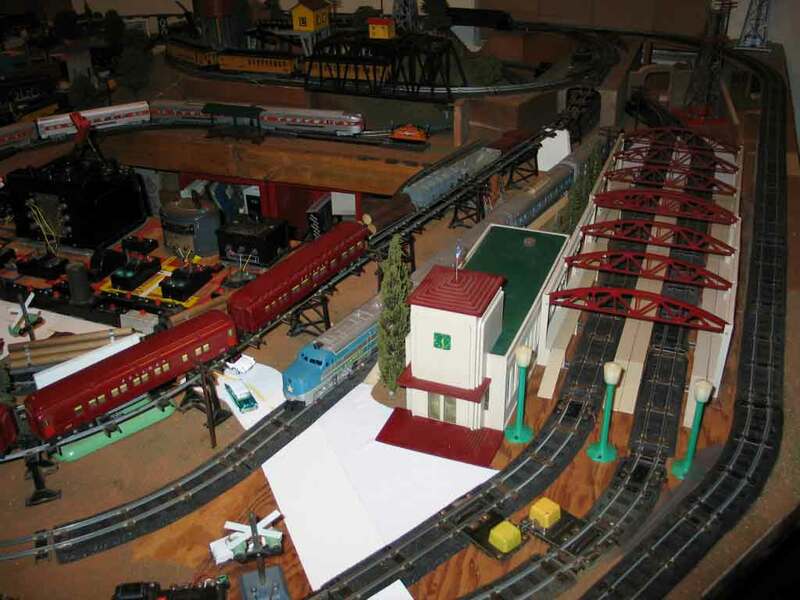 Then check out the Lessons Learned, Trains, Engines, Operating Accessories, Towers, Grade Crossings, Bridges, Buildings, Construction, Landscaping, Lighting and the History of the layout. Another section of the website began as a place to display the individual cars in my collection, both for fun and for insurance purposes. As I built it, however, a new vision emerged, that of a reference tool for the American Flyer community, "The Gilbert Gallery" if you will. I decided to collect pictures of the cars and engines that I didn't have in my collection. 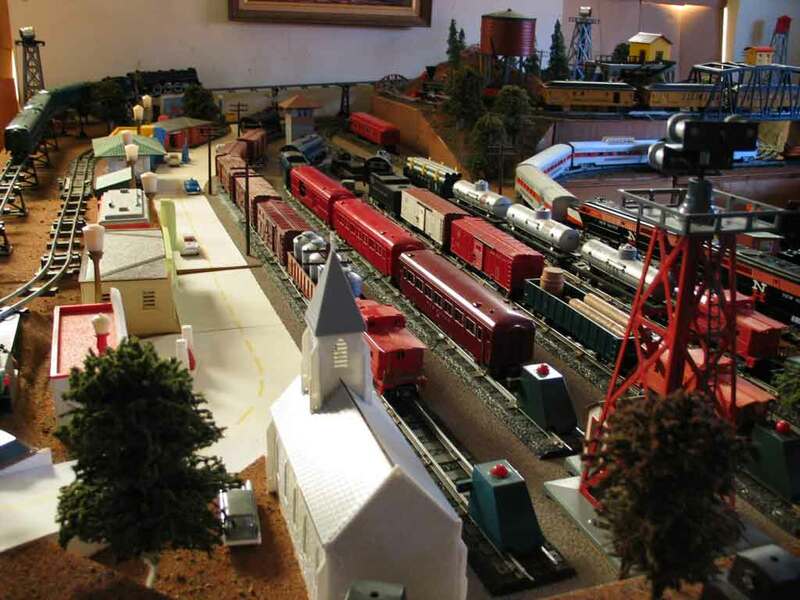 At this point, the site lists all of the S-Scale American Flyer products produced by The A. C. Gilbert Company from 1946 to its demise in 1967, and by Lionel since 1979. It provides individual pictures of almost all of the engines, freight cars, passenger cars, and accessories, including some very rare ones, though I don't yet have pictures of all the significant variations of each item. At present, it lists them all and shows pictures of over 90% of them. I am in the process of collecting pictures of freight and passenger sets and adding them to the gallery. 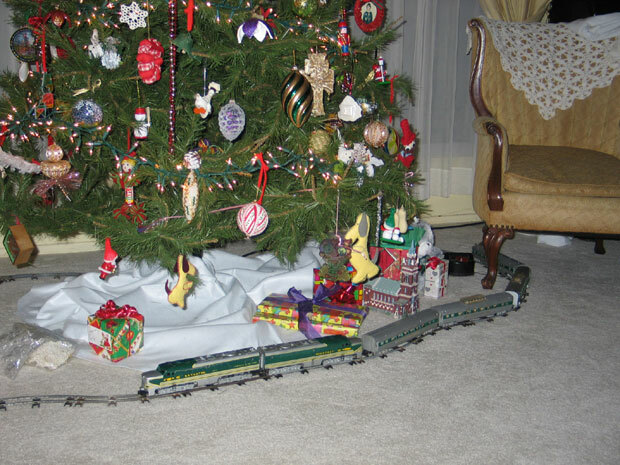 I thought the green motif of the Silver Rocket set would go well around the tree. Something in me insisted on putting in a bunch of curves rather than making it a simple loop. And it goes under the chairs on both sides because every train needs a tunnel or two. It's amazing how quiet a train is when it's running on plush carpet rather than on a table! 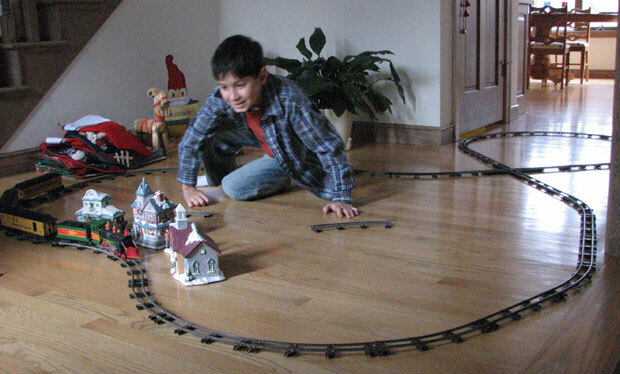 Here's my grandson Brandon with his Frontiersman train. Now for more pictures of the Upstairs Train. On the other side of the coin, I post pictures of surplus items I have for sale from time to time on my For Sale page.